Review by Justin D. Barnard, Ph.D. Among contemporary analytic philosophers of mind, cognitive scientists, and neurophysiologists, physicalism is all the rage. For the past thirty years, physicalism -- the view that everything there is, including human minds, is ultimately and exclusively composed of physical constituents -- has been (and continues to be) the dominant paradigm in discussions of what Shopenhauer purportedly described as a "world-knot" (Weltknoten), the so-called "mind-body problem." Historically, the mind-body problem represents Descartes' legacy. How can two fundamentally different substances (i.e., mind and body) causally interact? Of course, physicalists do not have Descartes' problem. Yet, discussions of the mind-body problem during the past three decades reveal that physicalism about the mind does have problems of its own. Among these is the problem of mental causation. It is a problem that one prominent philosopher of mind has called, "our mind-body problem" the problem of "finding a place for mind in a world that is fundamentally physical." If everything is ultimately and exclusively physical, then how can anything mental be causally efficacious? 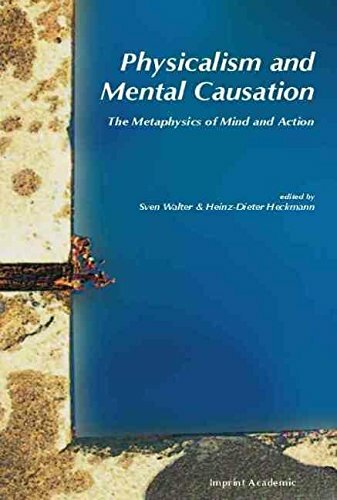 Physicalism and Mental Causation: The Metaphysics of Mind and Action by Sven Walter and Heinz-Deiter Heckmann (editors), represents an important contribution in the continuing effort among physicalists to unravel the Weltknoten of mental causation. The book is a collection of new essays (totaling just under 350 pages) by leading scholars in analytic metaphysics and philosophy of mind, notably: John Heil, Carl Gillett, Gene Witmer, E.J. Lowe, Andrew Melnyk, Ausonio Marras, and Terrence Horgan. The essays cover a range of recent, technical philosophical issues falling broadly within four different areas (each area corresponding to one of the four parts of this volume). The essays in Part I tackle issues related to the nature of physicalism itself and the relations between basic or fundamental physical constituents and the novel properties to which they might give rise (e.g., realization and supervenience). Part II includes essays that address the relation between two important concepts frequently discussed in recent philosophical literature: the notion of causal overdetermination and the principle of causal closure. Part III contains a set of essays devoted to the so-called "problem of causal/explanatory exclusion" -- a recent problem articulated and developed by a leading physicalist philosopher, Jaegwon Kim. The essays in Part IV focus on how mental states (e.g., beliefs, desires) can be causally effective in the production of human action within a physicalist framework. Each of the essays in this volume is philosophically rigorous and technically sophisticated. For this reason, an adequate (much less extensive!) engagement with its content is virtually impossible in a review of reasonable length. A thorough evaluation of this volume would require another book, if not several. Nonetheless, I feel obliged to report a minor disappointment for which this volume is admittedly only partly responsible. In the preface, Walter and Heckmann correctly point out that physicalists need to get "ontologically serious," otherwise "we [physicalists] are building sophisticated castles in the air" (p. vi). Such seriousness would be characterized by comprehensive and systematic explanations of such concepts as causation, property, realization, and physical. In their words, "A comprehensive philosophical reflection on the various metaphysical key notions and how they relate to the more specific problems physicalism attempts to solve is thus a much needed philosophical desideratum" (pp. vi-vii). As one entrenched in this arena of philosophy I could not agree more. Yet, while this collection takes many significant steps in that direction, the steps are unsystematic and in places disparate -- a weakness endemic to such anthologies. Thus, for all of their independent virtues, the essays in this collection, as a whole, contribute to a vice of which the editors ironically seem aware -- the lack of a common conceptual framework in the ever-burgeoning literature on physicalism and mental causation. The result is a conversation in which participants speak past and not with each other. Still, the fact that Walter and Heckmann have put together a collection requiring such careful consideration is not only a credit to its richness, but also will undoubtedly make it a significant contribution to current analytic philosophy of mind. However, readers unfamiliar with this particular aspect of the philosophical landscape or readers who lack a substantial degree of philosophical training may find the excruciating complexity a bit taxing. At the same time, Walter and Heckmann have done a masterful job summarizing the book's content through introductions at the beginning of each section. Moreover, each introduction includes a concise and remarkably accurate synopsis for each essay within the section itself. This collection is an essential volume for the libraries of professional philosophers and graduate students working analytic metaphysics or philosophy of mind. Justin D. Barnard, Ph.D. is a Lecturer in Philosophy at Messiah College. His research interests include metaphysics, philosophy of mind, and philosophy of religion.